Adding equipment to an exercise program is great, as long as it is well made and appropriate for your dog. When choosing products to use with your dog, first, you want to ensure that they are sturdy and safe. The equipment should be thick enough to withstand your dogs’ weight, nails, and body pressure. This is more of an issue with larger dogs, but care should still be taken with small dogs, as well. Burst Resistant Quality material is an important safety feature. If the piece of equipment is punctured while your dog is on it, Burst Resistant equipment will slowly sink to the ground. The alternative is a large P-O-P!! with the dog falling to the ground. This has the risk for both physical and psychological negative consequences. Second, make sure any equipment you use is free of chemicals. The last thing I want to do, and I am sure you agree, is negate the positive effects of exercise by exposure to harmful chemicals. Phthalates are often used to soften vinyl products and in humans have been linked to cancer, as well as endocrine and hormonal issues related to reproductive problems and depressed immune systems. 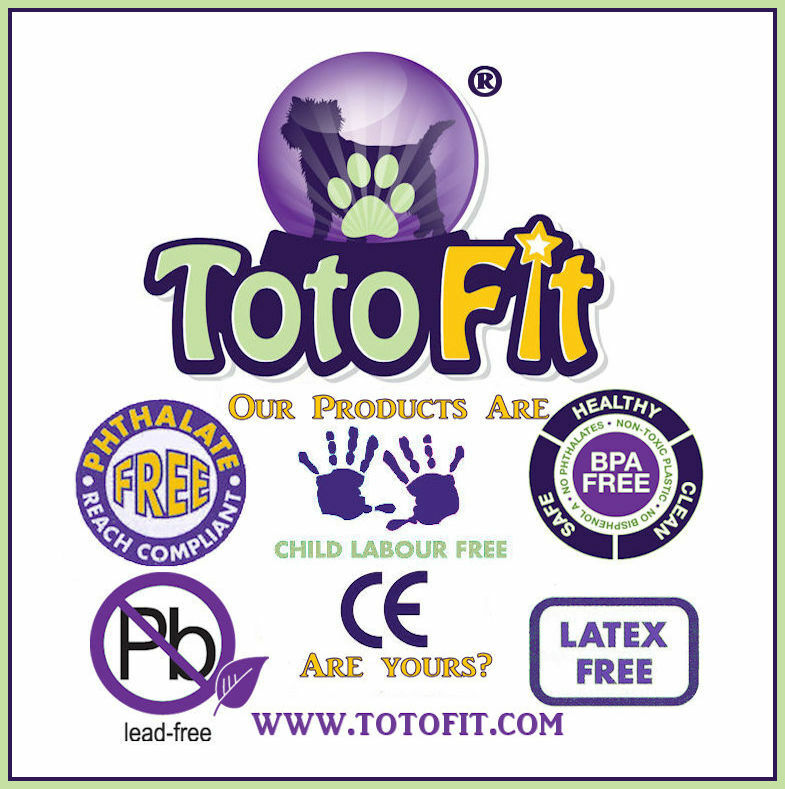 All the vinyl/rubber products you use with your dog should be phthalate free, latex free, and free of any other known toxins typically found in plasticizers—IMO dog toys, bowls and anything vinyl that your dog chews on, lays on, wears or works on should conform to the Consumer Product Safety Commission phthalate guidelines for children’s toys. If you have any doubt, contact the manufacturer. Often, if the products are phthalate, lead, latex and BPA free, it will be listed on the packaging. So be sure to read labels and product inserts. Third, decide what equipment ‘fits’ your dog. Some pieces of equipment look ‘cute’ but cuteness does not equate to safety or effectiveness. If in doubt, start low to the ground. Disks and wedges are always great to begin a fitness program with. Some important safety tips include never over inflating a disk, and watching the height. Large disks are safe for most dogs when at a low or moderate inflation. The large surface area and ratio of height to width is important. The height for a balance disk should be approximately one to three inches (2 cm to 6 cm). A large disk will be 23.5 inches across (this is based on the TotoFit K-9 Kore Disk) A small disk is typically one to two inches in height (2 to 4 cm) and 13.5 inches across (based on the TotoFit DISKit). This ratio helps to keep an unsecured product from flipping while the dog is on it. Flipping a piece of equipment, especially when being used by the rear legs, can cause stability issues in the knees, hips, hocks, and lower back. I would recommend a smaller disk, the TotoFit DISKit for smaller dogs to start, and the K-9 Kore Disk in the Base for larger dogs to start. Many owners have dogs who are different sizes. If this is the case, you can never go wrong with the larger piece of equipment. It will always allow greater versatility. Equipment that is long, with a narrow width and a high height, by nature has a tendency to flip. Over inflating the object will make it more inclined to rock and flip. This is the case even when used by the most agile of dogs. My rule of thumb is the dog should have a 6 to 1 ‘paw-ratio.’ For example, the piece of equipment should be at least 6 paws long and 6 paws wide. If the paw measures 2 inches, then it should be 12 inches wide and 12 inches long to perform safe initial exercises. 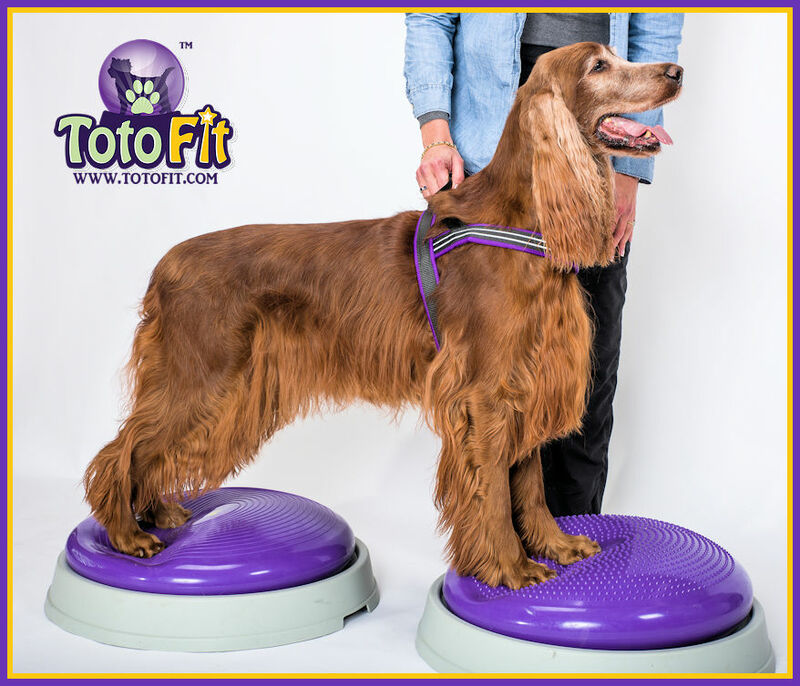 When dogs are beginning a canine fitness program, they require products that are low to the ground and provide good stability while they develop the core strength and balance needed to work on more challenging objects. I am sure everyone has stood on something that moved, they slipped, and instantly felt a moment of panic. We want to avoid that situation with our dogs. If you see your dog slipping or sliding on a piece of equipment, it may not be appropriate for them. Individual requirements are an important consideration in all aspects of your dog’s life. Dogs need equipment, exercises and fitness programs specifically tailored to their age, limitations, condition and goals! As always, thank you Dr. Debbie!!! You always provide such great info!